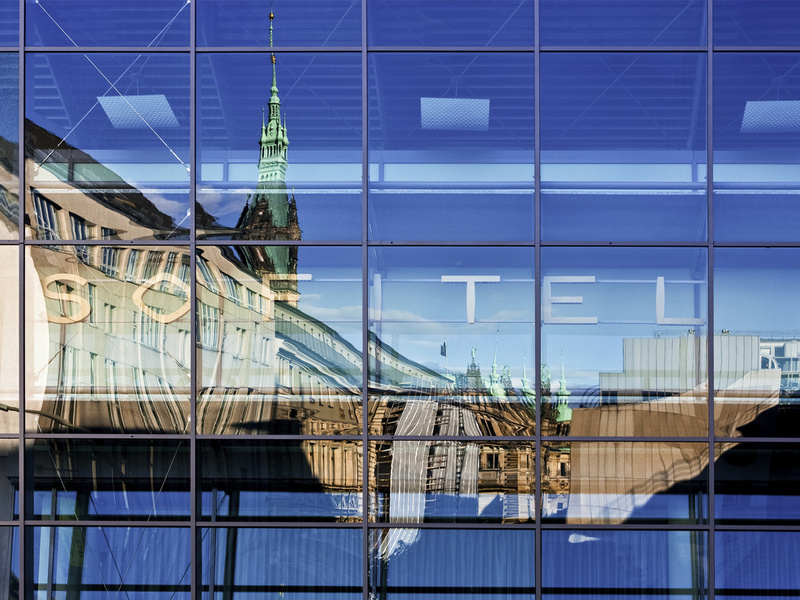 Hotel Sofitel Hamburg Alter Wal.Book your hotel now! Wifi! The Sofitel Hamburg Alter Wall near the River Alster and the town hall is a fusion of North German purism and the French way of life. Guests can enjoy international cuisine in our restaurant or have a drink on the unique sun terrace on the Alster canal. Start your sightseeing to locations such as the Elbe Philharmonic Hall or an extensive shopping trip to exclusive boutiques directly from the 5-star hotel. The Seagull Spa offers a restful oasis. The Sofitel Hamburg Alter Wall is located in Hamburg city center. The Stadthausbrücke S-Bahn, with a direct line to Hamburg airport, and Rödingsmarkt subway stations are within walking distance. You can reach the hotel by car directly from the A1 highway. The 241 spacious rooms, from Classic to Luxury Suites, have magnificent marble bathrooms, soft dressing gowns, WIFI and 24-hour room service. Some rooms in this first-class accommodation in the center of Hamburg offer views of the canal. In the heart of Hamburg, you can experience a culinary journey into Mediterranean cuisine, which has been delightfully interpreted by the Ristorante Ticino through the use of regional produce. For a seamless experience, opt for our "De-Light" menu. Guests can relax with a drink at the bar or on our unique sun terrace directly on the Alster canal. Be tempted by our contemporary drinks, homemade cocktails, lounge music and club chairs, and then forget the stresses of everyday life. Overall I am pleased with my experience at the Sofitel Hamburg. Location is fantastic, staff is good and friendly. Some areas of the hotel could use a renovation (e.g. refrigerators are not always working too well, cleaning standard could also be optimized a little sepecially when the room is cleaned after check-out. I have a general comment to the Accor program. This is regarding the drink voucher privided to guests participating in the Accor program at check-in. Guests do not get identical offers when staying at Sofitel hotels on different locations. At some Sofitel hotels there are limitations to what a guest can get for the voucher (e.g it is not possible to get champagne or spirits only beer, wine and soft drinks). This seems odd and it recommend the same standard throughout the Sofitel hotels. Everything as usual with nice spa, hamam and sauna. I took benefit of the upgrade of my room. Perfect. I felt like home. First time in this hotel. Very good location. This is a very stylish hotel with a spacious and well appointed room. I loved the bathroom & the view over the canal. Check in and check out was a little slow. With exception to the bar it exceeded my expectations. The problems were with the bar. There were technical problems with the draft wheat beer. The beer was warm and the barman explained he was having problem with extreme foaming and he apologized and offered a bottled version. This was a different type of wheat beer which I did not like. The barman eventually came back with a glass of the original draft wheat beer which I asked to be put in the fridge to cool down. This came back while cool did not taste quite right. I was charged for just 1 beer. I also ordered a burger from the bar menu. A very good quality burger but let down by the cold salad in the bun. Large and nice room, with a nice view on the city. Bathroom is with a shower and bath. The bed is very good to sleep well. Friendly and professional staff. Excellent stay: luxury hotel, large suite, excellent service (concierge, front desk, room, breakfast and restaurant), superb breakfast, excellent restaurant and nice decoration. Regarding the latter, it is not enough as it was far from being practical (see individual comments). noisy room with too short duvet blankets! woke up at 5:30 am with the rattle of the first train! called many times room service for changing the two duvet blankets for a large one, never got it! Never felt so comfortable and secure in any hotel like i did in sofitel hamburg. My favorite hotel in Hamburg when I travel for work! The girl at check in was fantastic. - I don’t know her name but was of Spanish heritage. Very good as normal but soured by waiting for 40 minutes to check out compounded by only one person behind the counter. The hotel is at good location, the Ubahn is abot 300m away. The breakfast was very tasty. Not my first visit, rooms are very good size with good facilities.